OK, I’ll admit it. I HAD to read Brian’s book. When I worked at Content Marketing Institute, I was the Book Marketing Manager in their amazing Book Division. Brian is easy to promote. He is brilliant. He is dedicated and enthusiastic about the work that he does for his clients. He is eccentric. He IS The Conversion Scientist. And I had NO experience with the book’s subject — marketing strategies that promote conversions. But, that is what makes my opinion valuable. I had no clue what website optimization or conversion rate optimization was and I certainly never thought I would need to. I know now that “conversion is the process of converting web traffic into leads and sales.” Pretty simple. In theory, that is. In the book, Brian explores the various levers a website owner has to adjust in order to tune their lead generation efforts to optimum efficiency. This is hugely important. Anyone from a small or personal eCommerce site, to a large corporation NEEDS to understand their website visitors in order to be successful. Beginners, like myself, find Massey’s book highly accessible and actionable. With its relatively short length and conversational style, it is a FANTASTIC introduction to the field of conversion optimization. I found it engaging, funny, and obtainable. What good is learning about traffic optimization if your website does not convert? 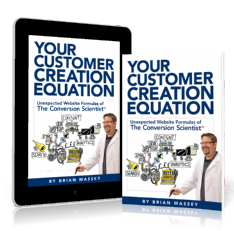 Brian’s book taught me that it is better to optimize for conversion first. 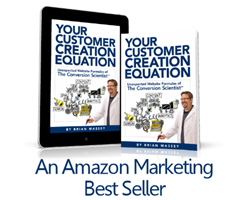 With instantly-applicable tips and nuggets of CRO wisdom, Your Customer Creation Equation is perfect for beginners all the way up to CEOs looking for practical and actionable guidance in order to start getting the results you need from your website, whether it be customers, leads, sales, registrations, or signups.